It was then off again with POLO+10 for POLO+10 World Tour but this time in Morocco and as guests of Monsieur Patrick Guerrand-Hermès. What an amazing place!! If you get the chance, even if just to see it, it’s well worth it. Stunning colours in a very raw, natural and set scenery with a beautiful carpet of the greenest polo fields you can imagine right on the beach. Superb facilities and a very warm and welcoming vibe. Hope to be back next year guys. It was then back up north to Europe where for the next 5 months from May until September I spent time in Poland, Germany, Holland, Switzerland and Liechtenstein. Really good polo at all levels with many new and friendly faces. Another first for me this year was visiting a town I had heard & read a lot about and had always wanted to visit: Dresden. I now know and understand why it is widely regarded as one of Germany’s most beautiful cities. The end of the season took me back to Holland for the first ever arena polo tournament held on the Museums square in the heart of Amsterdam. Partnering up with The Van Gogh museum, The Rijksmuseum, Stedelijk museum and the Royal Concert hall, all situated on this world famous square, the stage was set for what was an historic occasion. As in Maastricht, Paul Meulemans and his team who had been working hard on staging this tournament for several years, again hosted an amazing 3 day event. The very horse-passionate Dutch came out in full force to watch some excellent arena polo displayed by arena 10-goaler Chris Hydye who won the tournament alongside Jos Houben, Teun Swinkels and the very talented young Nils van der Hoeven. 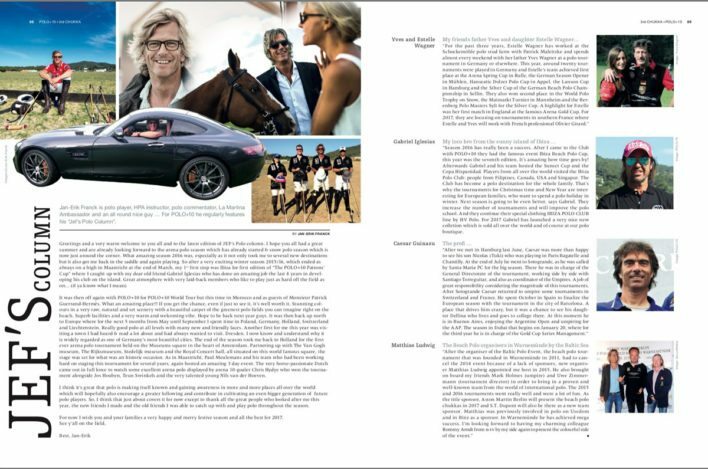 Jan-Erik Franck is polo player, HPA instructor, polo commentator, La Martina Ambassador and an all round nice guy … For POLO+10 he regularly features his “Jef’s Polo Column”.